Knowing when to protect yourself from the sun is important as it emits radiation which causes damage to our skin and health. We’re not saying to avoid being in the sun as it does also have health benefits, but by having one of the best pop up beach tents you can enjoy being in the sun and getting the right level of protection. Not only is a pop up beach shelter used as shade from the sun, but it can also be used for camping, hiking, fishing or even in your back garden. The height of sun shade tent won’t allow most people to stand up in but it’s the right height for you to sit on your beach chair or sun lounger. There are many items you can hire when you’re on the beach that are not usually that cheap, but a sun shade tent is probably not one of them. Having one will allow you to still enjoy lying on the sand whilst being shaded from the sun. Most of them will take a matter of seconds to erect and all of them fold up making it portable and convenient. In addition, it’s also worth considering a beach windbreak for those sunny but windy days! 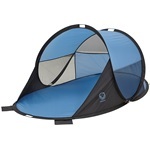 Deciding to invest in a portable beach tent is a wise choice, as some models can even be used as storage for your items! 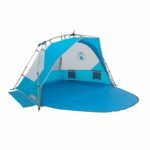 Knowing what features you would like would enable you to narrow down your choice, so you can pick the best pop up beach tent. Dimensions – The size of the sun shelter when erected will tell you how big it is and it’ll also give you an indication of how many people it is suitable for. 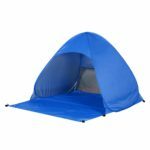 Packed dimensions – They all conveniently pack and fold away into a small compact size, this way you can take your portable beach shelter with you pretty much anywhere. Fabric – Usually made from polyester, this also gives a good level of protection from the sun’s UV rays. Pole material – Material used for the construction of the frame. 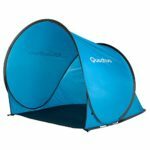 Zippable groundsheet – This feature is a big plus as it allows you to fold up the groundsheet which will zip all the way up so beach tent is fully enclosed. 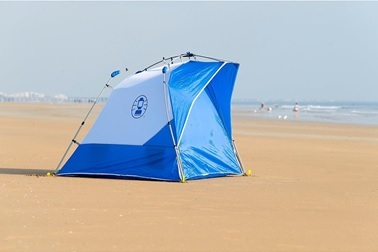 It is practical for when you want to take a dip in the sea as you can place all your belongings inside the tent, it can’t be locked but at least it’ll be a lot more difficult to steal something from you because your belongings will be out of sight. Internal pockets – Handy for storing things like your phone or a book so you know where things are rather than having to put it on the floor. Sand pockets – Located on the outside of the beach pop up tent, the idea is to fill up the pockets with sand if necessary to weigh it down. This may not be necessary if you decide to use the pegs provided to hold the tent down. 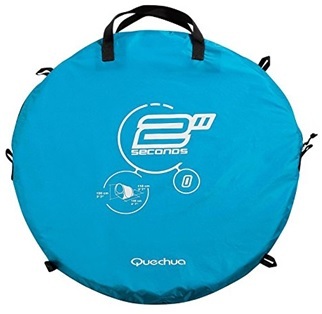 Carry bag – A carry bag will be supplied so the folding beach tent can be placed inside to make it easier to carry. 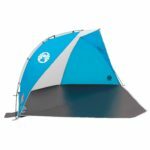 Weight – Designed to be lightweight as most people probably will be using it on the beach so the manufacturers make the beach tents as conveniently light as possible.